Clink…. clink…. clink…. “Joe! Don’t damage it!” you yell at your henchmen who is beating on your doomsday device without thinking about the damage it could cause if he isn’t careful. Stupid henchmen, why are smart ones so hard to come by? you think to yourself. In a few days you’ll unleash your master plan and take over all of London with your device and perfect escape plan. Only a few more things to do and then finally you will be done. You have spent months building, climbing the social ladder, improving your secret hideout, tightening security and buying exotic pets to firmly entrench yourself in the high ranks of society. Now soon, they will all bow to you and be at your command to do your bidding! Contents: 267 cards, 7 doomsday cards, 7 escape cards, 30 wooden cubes, 26 pawns, money tokens, 1 game board and 1 rule book. In What’s He Building In There? players are competing as Evil Doctors who along with their three henchmen, are racing to complete their doomsday machine and escape plans which both require inventions to be built before hand, climb the social ladder, build their evil lair compound, increase their security to keep prying eyes out or in maybe?… As well as acquire the rarest exotic pets to help establish their status in high social circles. Players only have 15 rounds to complete and launch their evil master plan and it comes quicker than you think. Can you build the biggest, baddest doomsday machine and escape plan to prove your superiority over the other wanna be evil doctors? Bring your blueprints, henchmen and let’s see if you are the genius you think you are. The evil doctor who garners the most points wins! 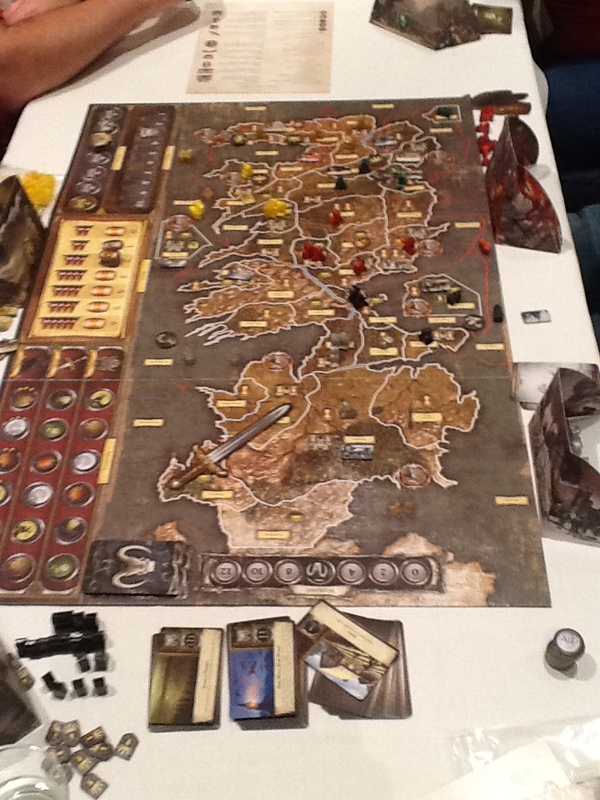 Game play consists of players each taking one action per player until all four pawns have been placed on the board. Every round, players will have new workshops (up to six cards depending on the number of players) to choose from that provide the raw materials or a chance to refine materials needed to build your doomsday machine and escape plans. The first player to place on these cards will usually get a “bonus” for being their first. This applies to first 14 possible places to play on the board. The last three tracks don’t provide a first player there bonus. Note that Evil Doctors can only be placed on orange spaces and henchmen can only be placed on gray spaces. On the workshop cards, the very first space is both orange and gray and provide a different bonus depending on which pawn was placed there. The next two spots to possibly play are money and taking the first player token. Then the next four spots are the Black Market spots that allow for things like additional refining, resource trading or money depending on which cards get placed on the board. The next spot is the Genius at Work (GAW) track. Every invention needed to be built plus your doomsday machine and escape plan need GAW hours to be built. These hours are spent every time you build and invention so you need to make sure that you have enough hours to complete your different levels of your doomsday machine and escape plan at end game. Only the Evil Doctor may play here. The next playing location is the Manual Labor (ML) track. This track is for accumulating enough hours from henchmen to build your final doomsday machine and escape plan. These hours do not spend as they are only used for the final project. Only the henchmen can play here. The next three tracks are an additional way to accumulate victory points. The first is the Social Track which is how players build their evil lair. If a player doesn’t have it built by turn five, they must pay rent every turn until they finally build it. This track racks up lots of victory points the higher up you build. Note that only the Evil Doctor may place on this track making it hard to get GAW or the first player bonuses on the workshop cards and acquire these points as well. The second track is the security track. This track accumulates victory points and the players must have built the “Real Estate” achievement on the previous track to build up to the second spot here being “Secure Fences.” The player who completes this track gets a bonus of +2 GAW and +2 ML hours at the end of game to help complete their doomsday machine and escape plan. The last track is the Exotic Pets track. This track also accumulates victory points and the “Real Estate” achievement on the first of these tracks must be built here again to advance to the second achievement. The player farthest on this track gets an additional +5 victory points at end game. The final step is to create and improve your doomsday machine and escape plan. Both must be completed to at least level 1 on their respective level charts indicated on the panel given or the player is basically disqualified. If either one is not finished to at least level 1, then the player cannot win the game period. The player has failed miserably as an Evil Doctor and must sit in their corner of shame and watch as all the other “real” Evil Doctor’s fight it out for supremacy. There are three possible levels on each doomsday machine and escape plan and you can complete as many on either that is possible as long as their is at least one completed on both. Each level requires more inventions to be built during game play and more resources on hand at end game. Each level is a nice jump in victory points at the end of the game. The board is very nice and easy to navigate. It is a long board so it will take a decent size table with plenty of space for all the cards and player aids. The pawns are typical wood pieces with the Evil Doctor being very large compared to the henchmen. It adds a tiny bit to the theme but nothing special here. The cards come in different sizes. The Invention Cards are bigger than most cards that come with games probably to big and take up a lot of space on the table and the resource cards are very small and difficult to keep organized as they slide everywhere. All are good quality and should last a long time. The Doomsday Machine and Escape Plan Cards are very thick stock with slots so they can be put together and used as a wall to hide a players money and resources. These are easy to read and very well done. A nice component actually. The way the board works with the invention cards is different as there are slots/space along the top edge of the board for the invention cards. These cards a previously said are very large and take up a lot of space. I am sure that the intent was to make it easy to read but it’s exactly the opposite here. If you are at the other end of the board, you can not read the icons at all to determine what resources you need to build it as the board is so long and far away. The player has to get up and constantly look or have it passed to them to read it. A resource track with smaller cards would have been a much better way to do this and dispense with the multitude of resource cards and length of board issues. This is my only complaint though. Otherwise, every thing is solid. What’s He Building In There? is a sleeper hit! It’s an extremely fun game with lot’s of depth, decision making and a great theme. The choices between what to take when and will you be able to finish this track or level before the 15 rounds runs out provides for a very fulfilling game. The time goes quite fast so you need to make sure you plan well and hope you can beat the other players to the punch. First player can mean a lot in this game. If you like worker placement games and want something new, unique and a game no one else has to bring to your game nights then this is a game to check out. I never felt like I had played this game before which is very common in worker placement games to me. The more people that play, the better the game as it gets harder to get things accomplished, keep your money engine running and rack up enough resources and hours to complete your end objectives. This worker placement game is a surprise to my gaming group! I highly recommend it and am looking forward to what Baksha Games brings to table in the future. I am giving What’s He Building In There? 8.0 out 10 stars. Shake….. Shake….. Loud crashing noises and the earth moving….. You look around trying to figure out what’s going on. Your home is shaking unbelievably, things are crashing to the ground shattering. You run outside to see every in a panic. Screaming, shouting and wailing coming from every direction. You start to panic trying to stop anyone to ask whats going on. They ignore you running in every direction, grabbing their children and old folk. Then you see it. You look up and see a huge plume of smoke rising from Mt. Vesuvius. Fire spitting out of the top of it. You stand frozen, you can’t believe what you are seeing. Your panic sets in deeper as you don’t know what to do. You run back in the house, grab your family, shouting at them to drop everything and run. They are crying, they don’t understand, your daughter grabs her doll and you all fun for the door trying to keep your balance as the earth shudders and tosses you around. You grab your daughter into your arms as she fell and hurt her leg. As you exit the door, you look back at the volcano and see lava erupting and hurling large chunks of lava in to the city! One narrowly misses you as it crashes into your home. Lava pours down the sides of the volcano and towards the city. You and your family take off running as fast as you can away from the volcano. Where do your run to? How do you get away from this disaster? Contents: 120 wood pieces, 62 game cards, 45 lava tiles, 3 dual vent tiles, 1 volcano, 1 cloth bag, game board and rulebook. In The Downfall of Pompeii, the players compete to place as many of their pieces on the board as possible and then race to get them out of the city before the lava takes them over and covers them or traps them essentially eliminating them from the game. The game is played in two phases the first of which is the players trying to populate as many of your own people as possible. The second phase when Mt. 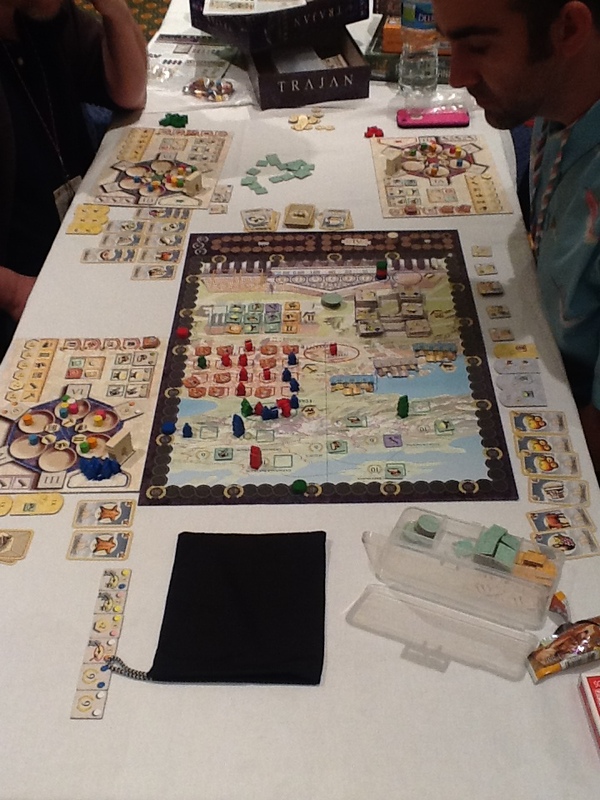 Vesuvius erupts is when the players try to vacate as many of their people as possible out of the city. If you people get caught, they get thrown into the volcano! The person with the most amount of escapees is the winner. The Downfall of Pompeii is a short family oriented game that is easy to learn and provides enough challenge for any “serious” gamer to enjoy for the most part. Someone will always argue this point I am sure. This is a revised edition of this game originally published in 2004. The only new addition to the game is the “Dual Vent Variant” which is 3 double sided tiles giving the player a choice of which side to play. The Downfall of Pompeii is more strategic than you might think. After the players play the initial eight cards and draw the first A.D. 79 card, then they get to place their “relatives” on the board allowing for additional pieces to get a chance to escape. Being that the initial placement of the pieces are dictated by the card being played, once the piece is played in a building, that player then gets to play “relatives” equal to the amount of pieces in the city square portion of that building, meaning you could play up to four additional pieces in one turn if that building is already full. You cannot chain this effect so once you get the first batch of relatives on your turn, that is all the relatives you will receive during that turn. The relatives must be placed in different empty building spaces after that. This is one of the key component strategies of the game. The other is when the second phase kicks in, the players now get to move two of their pieces. Each equal to the amount of pieces currently in that building. So if you have three pieces in that building before moving, then you get to move three city squares to try and escape. Of course you move into spaces with lots of pieces in it, to try and get all those movement points the next turn. There is a nice level of depth here to provide a “game” and balance the randomness of the tiles being pulled out to place the lava. Their are six lava starting points on the board represented by six different symbols all on the tiles. When players draw a tile, they must put the tiles in accordance to the symbol. The first tile of each symbol must be placed on the starting city square before placing anywhere else. From there on out, the tiles must be place directly next to a tile with the same symbol and never diagonally. After the second A.D. 79 card comes into play, all the players discard their cards, put their remaining pieces back in the box and then pull one tile to place and move to of their pieces on the board to escape the lava flow. The components of this game are decent. The artwork is good but standard. The tiles are thick and will last a long time. The cards are good weight and coated so as to not get all dirty and peel. The board was a tiny bit warped but not enought to effect anything. The volcano is just a piece that folds in a circle and two little tabs slide into their slots making a serviceable volcano. We are working a styrofoam one to add a little more theme to the game. The tile bag is practical but probably the cheapest element of the game. I am still pulling loose threads out after many plays. All in all, The Downfall of Pompeii is a good, solid and fun family game that is easy to pull out, teach and fit into any gaming situation. Ideal for maybe gaming during lunch at work, the initial warm up game at a game night or teaching new gamers about the great hobby of gaming and of course family game night. Even thought the theme might seem a bit gruesome, it really doesn’t play at all in the game and is completely safe for kids. Mayfair Games even did a nice job of putting some actually history in the rule book to describe what happen when Mt. Vesuvius actually erupted. You’d be surprised at how many people didn’t know a thing about what happened with Pompeii and had no idea it was a real event. Some people complain about the set up with the cards, but I found that to be not a negative at all. It’s very simple, quick and shouldn’t bother anyone. It’s a very light set up game and packs a lot of fun into a short amount of time. I am giving The Downfall of Pompeii 7 out of 10 stars as it provides a nice fit into so many situations and provides enough depth while being a light game. 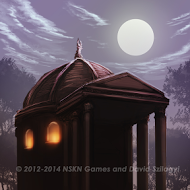 NSKN Games announces Praetor, their first board game release in 2014 and their largest hobby release to date. Praetor is a strategy board game designed by NSKN Games and published in cooperation with 8 other publishers in 7 languages. Designed and developed in English, Praetor will also be released in German, French, Japanese, Korean, Polish and Romanian. In Praetor you will take the role of a Roman engineer and you will work together with the other players to build a magnificent city. You will manage your limited resources wisely and look for new ones, you will recruit new Workers while your old experienced ones will retire, you will build settlements to keep the population happy and you will praise the Gods to earn their favor. Caesar will reward you if you give away precious resources to build Hadrian’s Wall thus increasing your chances of becoming Praetor. Every turn you will place your Workers on previously built City Tiles to gain resources, Morale, new Workers or Favor Points. You may also assign Workers to build new City Tiles or spend resources to meet Caesar’s demands to gain Favor Points. At the end of each turn, you will have to pay your Workers. Otherwise, the mood in the city will deteriorate. Most of the actions your Workers will perform will help them gain experience. They will become increasingly skilled in collecting resources. Your most experienced Workers will eventually retire and bring you additional Favor Points but you will still have to show solidarity and pay them until the end of the game. The game ends when there are no more City Tiles available or when Caesar has no more demands for resources. The player with the most Favor Points will be appointed Praetor and win the game. The first 200 copies of Praetor (English edition) can be pre-ordered directly from NSKN Games until April 21st, with multiple delivery options (worldwide shipping, UKGE and Spiel’14 Essen pick-up). The official European release will take place on June 1st, 2014 at the UK Games Expo (Birmingham, UK) and the game is planned to reach the majority of hobby retailers throughout Europe in June 2014. 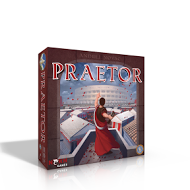 The English edition will be carried by major hobby distributors in the United States and although a North American release is not planned yet, we expect Praetor to make its debut at GenCon in August 2014. 64 Ounce Games and Richard Gibbs have announced today that they released their new Kickstarter campaign to make board and card games accessible to the blind in order for them to be able to play on their own or with their sighted friends. How cool is that? Starting with transparent card sleeves, 64 Ounce Games will work to make existing copies of games ready to play for the blind. This is the most worthy cause I have come across yet on Kickstarter for board game programs so please get behind this! Creak….. Creak….. Drag…. Thump, Drag….. Thump. The noise grows closer as you hear ragged breath emanating from whatever is getting closer. You peak through the slit in the door frame and see a human forming moving closer to you. Limping along, it is misshapen you can tell from the back light. Trying not to make a sound, the hair on the back of your neck stands up as you know something isn’t right. A chill runs down your spine as it just keeps coming. How does it know you are in there? You feel around for anything you can find as a weapon, trying to not make a sound. Finally it moves in the light coming through a window from the moon. Hollow eyes stare at your location, flesh hangs from its face and hands. Dried blood covers its clothes and it skin is grayish, rotted and you can start to smell the stink of a…. dead body. Suddenly, you notice more figures moving your way…. The same slow gate, and you realize they are there to help you. Panic rises and your breath grows shallow. What are you going to do, it’s almost at the door. You feel something round, wooden… a bat? You grip it tight, waiting for it to open the door. Contents: Zombie deck (55 cards,) fate deck (41 cards,) six character cards, 50 tokens, 3 scenario cards, 2 turn reference cards, 1 zombie ability reference card, scenario book and rule book. Parental Advisory: Theme not safe for kids however, there is no blood or gore. The card art is the only real issue here. If I am Going Down… by Van Ryder Games is the first DCG (Dying Card Game) at least that I know of on the market. What does this mean? It means you will die playing this game. No two ways about it. That is definitely a new marketing position if I have ever seen one. Being a able to play as a solo or a co-op with another play is a nice new twist as well. Also a nice feature is the fact that is scenario driven. You can play with or without the scenario book and even create your own scenarios. In If I’m Going Down…, you place cards in set pattern and battle zombies as they move closer to you. Each character cards has unique abilities and operates better with certain weapons than others. You start the game with 3 items/weapons and can search for more on your turn to upgrade so to speak or ditch weapons which are no longer of any use. Most of the zombies are generic but some have special abilities that make it harder to kill and some pop up right next to you. The object of the game is to see how many zombies you can kill before they finally kill you. When I first played this game, I found it to be fun but something that could very easily get old quickly. The first game I played was about 60 minutes and then I found a couple things I was doing wrong with not paying enough attention to the symbols on the zombie cards for effect. Then I played again right after that and the game never ended. Two hours in. and I am killing everything in site over and over again. I finally had to leave for a meeting otherwise I could have been there a very long time. If I’m Going Down… is a well thought out game for the most part. It’s a bit of very cool and a bit of meh. I can see where A.J. has a great head for game design. He did extremely well in designing the components. The resources cards are double sided and very easy to understand and give you all the info you need while playing. The rule book is very well done. The scenarios are well done as well and the fact that you can create your own help with re-playability if you want to invest the time. Otherwise, this doesn’t have a ton of re-playability. It does suffer from the feeling of just going through the motions doing the same thing over and over again. However, it’s a very solid effort, with a few different zombies thrown in, and maybe a variant that increases the overall decision making, then this game becomes a whole lot better. Right now it’s basically a hack and slash card game that has great potential. The other issue I had was the character movement. Can they? It isn’t listed as an action yet it is referenced in the rule book. I figured it should be an action, so I used the same movement as a zombie. One space per turn. This needs to be clarified unless of course I missed it. Like I said before, the components are well done both in ease of use, structure and materials. The art work is good, but could be better. Being the first game, I am sure budget may have had a bit to do with this. A.J. included a spacer on the back of the rule book to help keep the card rows straight. That was a great idea to be included. There were a lot of little touches A.J. thought of that many designers and publishers don’t. Over all, If I’m Going Down… is a decent game that is best suited to people who are zombie fanatics, love solo games and really like hack and slash. It’s not a must have game, but it isn’t bad either. It’s a very solid first (I believe) effort from Van Ryder Games. Based on what I have seen here, I am excited to see what else they bring to the table as they show great promise for future games. I am giving this game 6 out of 10 stars. “What the …. ?” The lumber yard is bustling more than ever as you look upon scores of elves picking up wood for whatever project they are working on. “What is going on?” you ask the yard foreman. “Seems that the King has requested a lot of building to be done.” he replies. “What? I was given the license to build for the city. I won that job!” Hastily making your purchase you take your load to the job site where currently underway, you have a tower going up. As you walk towards the site, a dwarf runs up to you handing you a letter. Reading the apology sent by the Assistant Deputy of the Assistant Deputy, it states the King has decided that because of a clerical error, many master architects have been hired to build for the city. When building season ends, the King will hand the Key to the City to the one master architect who truly deserves it. “I can’t believe this!” you scream. “Grunt! Get over here!” A dwarf red of hair, stout of build and covered in dust and dirt from the morning work ambles up to you. “Yes sir, what do you need?” he grumbles as if he is to busy to be bothered. “Hire, all the help you can, elves and dwarves alike! Get as many gnomes as we can muster and get to building as many building as we planning all at once. Make sure you are first to the quarries, lumber yards and gold mine. We need to be ahead and better than everyone else. Well don’t just stand there! Move!” you shout. “Yes sir!” Grunt starts yelling at workers, giving them orders and point in directions for them to go. Then he scurries off to attend to his mission. Shaking your head, you mind reals from all the work, long nights and personalities that will create issues you will now have to deal with. “It’s always something” you mutter to yourself. You set your mouth in grim determination and your mind to make sure that you will have that Key to the City at the end of building season and no one is going to stop you. Contents: 5 Game board districts, key to the city, calendar board, collection board, 50 property cards, 5 turn order crests, 1 calendar marker, 5 player boards, 12 guild tiles, 30 wood logs, 30 stone blocks, 20 metal bricks, 46 gold coins, 6 multiplier chips, 35 dwarves, 35 elves, 22 gnomes, 60 property markers and 5 scoring markers. In Belfort, each player is sending their loyal crew of Elves and Dwarves to the tasks of gathering resources, gold and constructing various buildings that have unique abilities for increasing influence in the city. Hiring Gnomes as staff for the building thereby, activating many of the special abilities and helping the player achieve success. Likewise, players can hire guilds to help along the way. As each player is building in the five districts, their influence grows and knowing what and when to build can be critical to their success. According to the calendar, the scoring will be done three times throughout the building season. This will based on each players influence in each of the five districts as well as the size of their workforce of Elves, Dwarves and Gnomes. By the end of the seven rounds, the player who has earned the most points wins the Key to the City! First let me state that Belfort is an amazing worker placement game. It is very well thought out and offers plenty of strategy while it is still simple to learn and understand. With all the worker placement games out there (and there are tons of them,) this one to me stands hands above most of them. 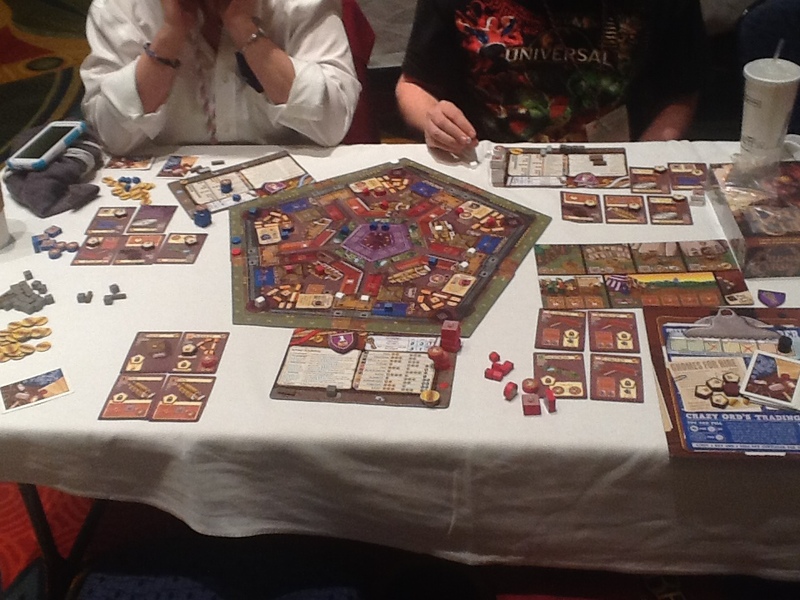 With the popularity of gateway games of the genre like Lords of Waterdeep, Belfort brings much more to the table. The theme stands out to me immensely. I am not sure why exactly but it probably is a combination of many things such as the artwork, story and feel of the game. Many games of this style have themes that are just pasted on such as Lords of Waterdeep and have really no effect on the game. The mechanics of cube pushing are really all that matter in providing the character of the game at this point. Belfort somehow manages to incorporate their theme into the overall experience and make it absolutely critical to the experience. The strategy of the game is quite deep and yet only feels like a medium weight game. If the players are familiar with euro style games, they will pick this up very easily and a great game will be born every time you play it. Yet as stated before, it is a good game for new gamers to learn and pick up quickly. This also serves very well as a family game as there is nothing for adults to have to worry about theme wise. The artwork of Belfort is top notch and really, really adds a lot of flavor to the gaming experience. The components are some of the best yet for a euro game. The boards, guilds and other pieces are thick and colorful. There was no warping whatsoever in my copy. Everything is easy to read and understand. The cards are of good stock, weight and good artwork. A little assembly is required as you need to put stickers on the different colored playing pieces when breaking open the game. My only complaint may be that player boards might have been a bit better as you need a lot of room to play this game. The building costs are on the player board and on the cards again. I have yet to see anyone use the board to determine the cost of building. Some space may have been saved here and there, with the calendar board, resource board and player boards and a little better planning, but this is a very minor complaint. As over all this game is awesome. Belfort has become my go to game in worker placement genre. I have to play anything of this weight that is this fun, deep and easy to learn. 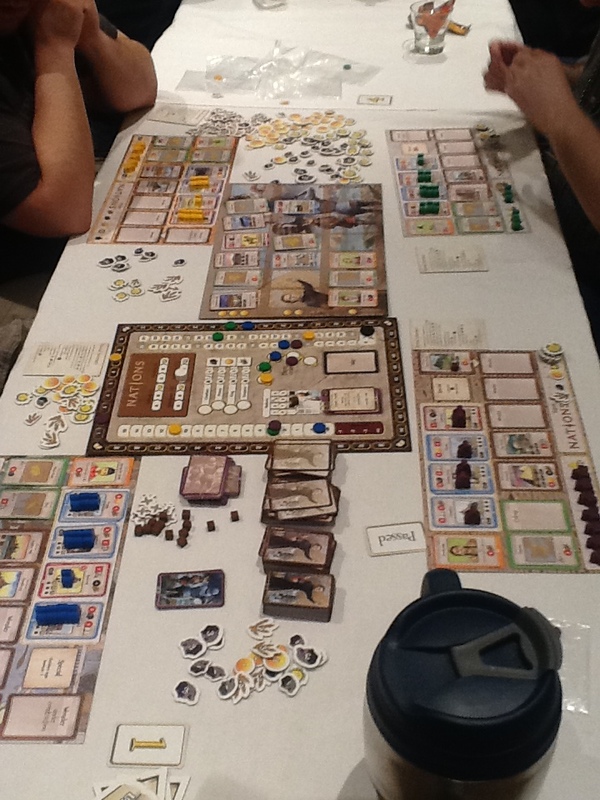 While there are many great games out there, Belfort should be a table favorite for a long time to come. You don’t shelve great games and Belfort is a GREAT game. I am giving Belfort 8.5 out 10 stars. The board game industry is all about the “Cult of the New” now. 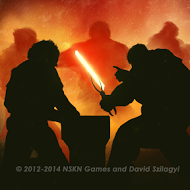 The next big game, next exciting Kickstarter, that is what is driving companies these days. It’s new content and a constant driving sales force and we as board game lovers fall in line and buy all that we can as it comes out. We forget about the games that came out before as the new games make it to the table five or six times before the next hot thing arrives for us to drool over. For years great games came out at a much slower pace before Kickstarter started launching what seems to be 50 new games a week. “old” games (anything over a year old it seems) as all the scuttlebutt is what is hot now or coming out. This is why I started the “Revisiting the Classics” reviews for Club Fantasci. There are so many great games that people forget about or have never discovered and that is a shame as many of past years games are just as good or better than todays games. How can we tackle this problem? Well, first of all publishers have to learn to market their past games as well as their new games. Learning how to drive traffic to your website is key in any marketing strategy and then having the content there that is on the FRONT page is where it is at to successfully sell your whole catalog. You can do this in rotation so as not the over clutter your home page. Recently I wrote a quick review for Le Phantome de L’ Opera for Asmodee Games. They put it on their front page of their site a couple months ago now and I still get hits on this review from their site. Is it selling games? I don’t know, all I know is people read this review everyday. That should help sell games if it’s a good review. Mayfair Games posts reviews on the games direct page on their site but many of the publishers ignore this content or only post it on their Facebook page or twitter. While this makes your social media strategy easy as you always have new content (although many still don’t use this) it isn’t helping make the sale on your webpage. Many may not agree with me, but I am a firm believer in leveraging your resources and board games reviewers are the publishers most power free resource their is. So publishers, when a review comes out, if you feel that is a great piece to help sell your game, use it. Don’t just use your favorite reviewers, you will alienate the other ones. Judge the review on it’s own merit and use that. Help the reviewer out as they are helping you out. Maximize your online sales strategy with smart, efficient and effective marketing and watch your sales grow. Take care of your reviewers and they will take care of you. Most of all let’s do it for the love of spreading our love of this amazing hobby and the great games from before. 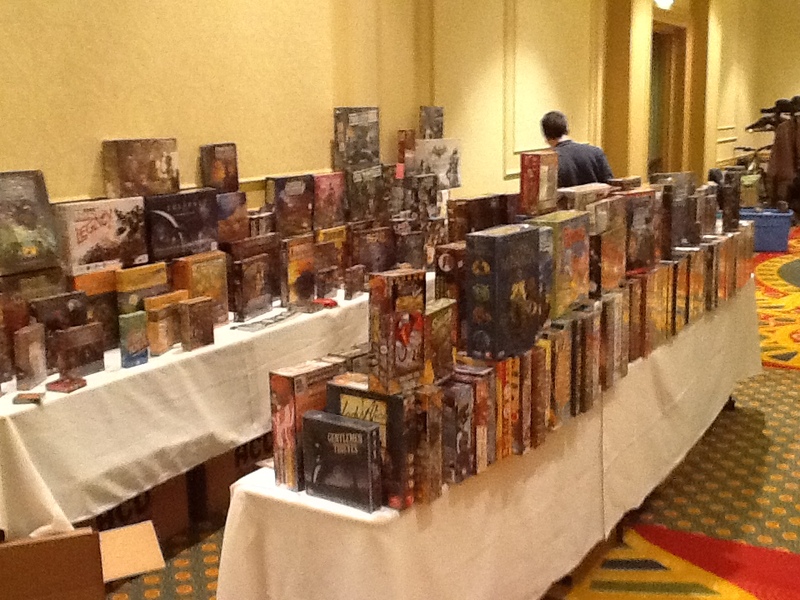 The TN Games Days held it’s 9th convention from March 14th – 16th in Franklin, TN at the Cool Spring Marriott this last weekend and let me tell you it was a blast. 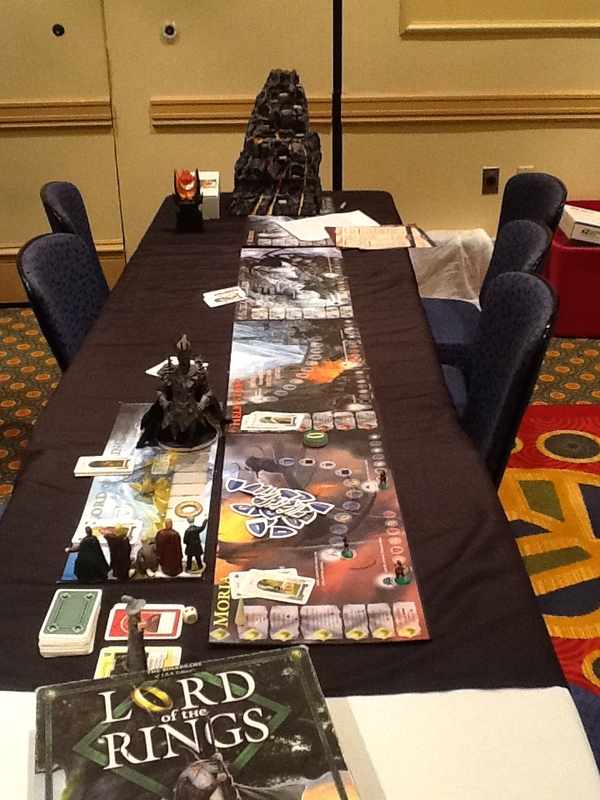 It was my 5th time and first time as a sponsor at this board game convention and each year it gets bigger and better. This year it grew by about 80 attendees to reach 350 people total. The event run by Rick Kuehler, Bo Link and Russ Rupe (Conquest Gaming, LLC) was very well done as usual and is one of the events I most look forward to every year. Starting at 8:00 am on Friday morning, the convention hosts events all three days including things like a flea market, math trade, 3D Battlestar Galactica (thank you Craig Herbert,) Crokinole tournament, Wits & Wagers tournament, designers showcase, a Tessen tournament, Conquest of the Empire, a charity auction plus tours of games for the attendees to participate in and register to win prizes throughout the convention. Quick Gaming Tour – Escape: the Curse of the Temple, Love Letter, For Sale, The Resistance and Snake Oil being the featured games. Calendar Tour – Around the World in 80 Day, Kingsburg and Dungeon Lords. Cult of the New Tour – Relic Runners, Space Sheep! and Parade. 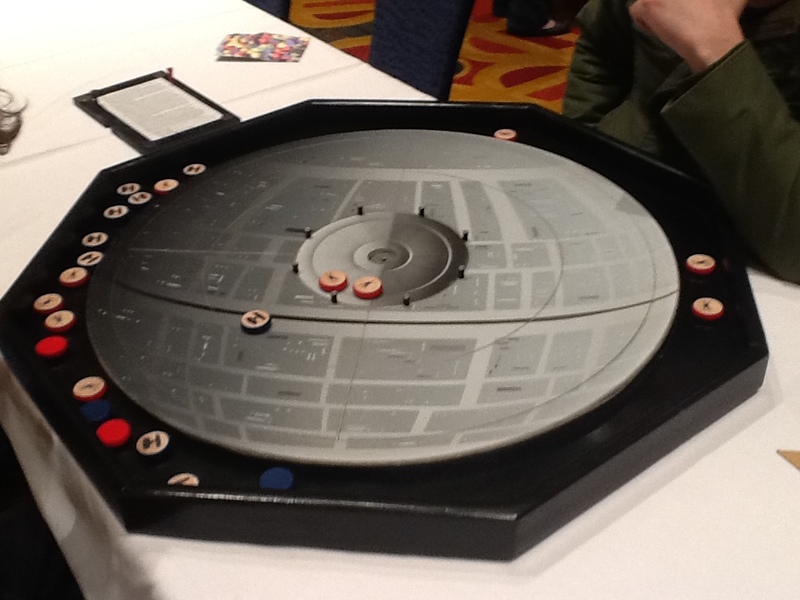 The Constructables Tour – Steam Park, Wits & Wagers, Stecon: Infinity. Personally I was able to teach two epic games of A Game of Thrones 2nd Ed., one was 4 hours, the other was seven hours (I love this game,) played Battlestar Galactica (humans lost at the last second,) Trajan, Nations, the brand new Marvel Legendary expansion: Paint the Town Red, Belfort, DC Deck Building Game twice and Spartacus: A Game of Blood and Treachery. Friday I left at 3am and Saturday at 4 am. It was fun! One of the great things about TN Game Days is it feels very intimate. Even though there are tables full of people everywhere, it isn’t to loud. You can hear the players, have plenty of space and you are close to everything you could need. The hotel is great, a bit pricey at $119 a night but it’s worth it right? Every year, I meet new and amazing people who come from all over the US to attend the event. Although I only got a couple new games in this year, it was well worth it as getting the big games to the table is always hard. Game Surplus, Out of the Box Publishing, AEG, Conquest Gaming, LLC, Days of Wonder, Rio Grande Games, Roll The Dice, Bring Your A Game, Stronghold Games, Van Ryder Games, Let it Sew, Meeple Source, Z-Man Games and Club Fantasci. 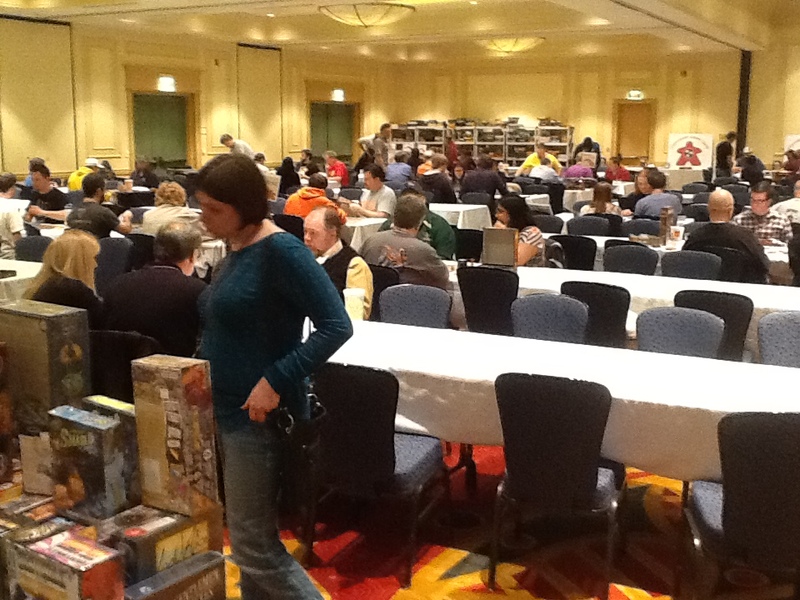 Next years TN Game Days will be March 13th – 15th at the same location. Don’t miss this! If you have any questions about attending in the future or sponsoring please email me or get a hold of TN Game Days here: www.tngamedays.com. Ships, Cargo and Pirates oh my! Manifest: The Board Game is set in the roaring ’20s as players compete to ship cargo, flee pirates, hope the stock market doesn’t crash to devalue their cargo and deliver passengers while not get lost at sea or sink altogether. Billed as a family game that has enough weight for serious gamers to enjoy this one to look at and support before it goes away. Only 15 days left to contribute!